During World Environment Day 2018, the theme was "Beat Plastic Pollution" and slogan was "moving towards a plastic-free future". 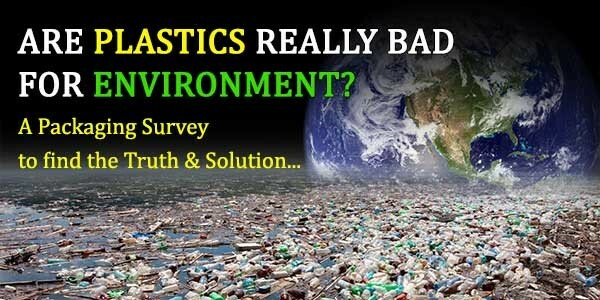 But don't you think blaming plastics alone is not right. It is true disposable plastics, bottles and non-recyclable waste is the worry of every one but banning all the plastics is definitely not the solution. There are ways which by which we can reduce plastic pollution but we have to make efforts to follow them. Simply banning a laminate or a PET bottle can never give a satisfactory solution to this global problem. Plastics are not inherently bad. It's what we do, or don't do, with them that counts - Sylvia Earle (National Geographic Explorer-in Residence). This quote is actually true, the issue is not with the plastic but with our disposal systems, waste management and our habits. To understand your thoughts, Packaging Connections Team created a small survey and we got a great response by 119 people. We got positive replies in response to "should we contact you to discuss about the possible solutions". Well, we are soon going to contact the interested people and plan the way forward. Our team analysed the results and prepared a crisp report. This includes statiscal data received from the survey supported by graphs and numbers.